The Roman soldier pushes a sponge on a reed up to Jesus' lips. James J. Tissot, "I Thirst" (1886-1894), opaque watercolor, Brooklyn Museum. Larger image. It is near the end of Jesus' human life. He senses it. He has hung on the cross for six hours now. It has become hard for Jesus to even get a breath. Hung from his arms, he must pull himself up each time he wants to breathe. His shoulders ache, his mouth is parched. He is exhausted. And yet he does not want to die without a final word. He asks for something to drink to wet his lips for this final effort. Apparently Jesus asked for something to quench his thirst in order to fulfill Psalm 69:21. This was not the first time Jesus had been offered wine. Both Mark and Matthew observe that he was offered bitter wine just prior to being crucified (Matthew 27:34; Mark 15:23). Perhaps this was intended as an intoxicant for those about to suffer pain. A group of Jerusalem women, as an act of piety, provided for a condemned man a vessel of wine containing a grain of frankincense to numb him.47 Jesus refuses to drink this. He has committed himself to the Father to offer himself as a sacrifice. To attempt to lessen the pain of this sacrifice would have somehow been going back on this commitment. The offering of something to quench his thirst after hanging on the cross for some time is a separate incident. Wine vinegar (oxos) didn't have any alcohol left, but was sour wine that had turned to vinegar. Wine is made from grape juice. Yeast fermentation causes sugar to be transformed into alcohol, which continues until the alcohol content reaches about 11% to 12%. Wine vinegar, on the other hand, is made by the action of acetic acid bacteria on alcohol to produce acetic acid. Since the bacteria that cause this reaction are aerobic, they require that the wine be exposed to oxygen in order to form vinegar. What is a container of wine vinegar doing on Golgotha that day? It is posca, a drink popular with soldiers of the Roman army, made by diluting sour wine vinegar with water. It was inexpensive, considered more thirst quenching than water alone, prevented scurvy, killed harmful bacteria in the water, and the vinegary taste made bad smelling water more palatable. All over the empire, posca was the soldier's drink of choice. The soldiers had brought posca to sustain them during their crucifixion duty. They weren't getting drunk on it, just using it to quench their own thirst. 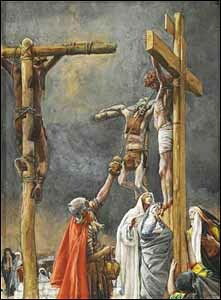 While a condemned criminal might be able to drink wine prior to being crucified, drinking from a cup while hanging on the cross wasn't practical. So when Jesus indicated his thirst, the soldiers used a sponge to give him posca to slake his thirst. No doubt one of the soldiers offered Jesus a drink of posca from his own supply, using his own sponge. A soldier wasn't required to share his drink with the criminals under his care. But he had seen that Jesus was dying unlike any other criminal he had ever seen. No cursing, no blaming, no anger. The posca offered by a soldier on his sponge that day was an act of mercy to the One who was bringing God's mercy to all humankind. John makes a point of specifying the hyssop plant, a small bush with blue flowers and highly aromatic leaves,49 whereas the Synoptic Gospels refer to it as "stick" (NIV, NRSV) or "reed" (KJV, RSV).50 What is the significance of hyssop? Hyssop was used to sprinkle blood on the doorposts and lintels on the first Passover (Exodus 12:22). It was associated with purification and sacrifices in the tabernacle (Leviticus 14:4, 6; Numbers 19:6, 18). No doubt John had this in mind when he wrote his Gospel. For a few seconds, at least, Jesus sucked the posca from the sponge. He didn't drink long enough to slake what must have been moderate to severe dehydration from loss of blood, exposure to the elements, and the necessity of gasping for breath through his mouth. The end was near. So he drank only enough to moisten his parched throat so that his last words of triumph might be heard across the hilltop of Golgotha. What Does This Word Tell Us? First and probably of greatest importance, Jesus' word "I thirst," reminds us of Jesus' physical nature, his humanity. This was no play-acting on the cross -- a divine being pretending to undergo a physical act of torture that could not touch him. This was tangible physical suffering, of which extreme thirst is the one element most of us can readily identify with from our own personal experience. There was a heresy afoot in the Hellenistic world that Jesus didn't really come in flesh and blood, much less die a gruesome physical death on the cross. Flesh was of the evil realm, they believed, and could never be holy. Only spirit was capable of the divine. So Jesus didn't really die, he only appeared to. He was only pretending. Thus said Docetism and Gnosticism. Jesus Fifth Word, "I thirst," reminds us that Jesus died in the flesh for us and for our sins. Third, Jesus said, "I thirst" to strengthen himself and ease his throat so that he might cry out his final words from the cross "with a loud voice." He was summoning himself to bring it all to completion. Father, extreme thirst, being parched, is something I can relate to. But adding to the physical torment and exhaustion was the crushing spiritual aloneness. That is beyond my experience. Thank you for your love that conquered all to save us. In Jesus' name, I pray. Amen. Q5. (John 19:28) What do you learn from Jesus' Fifth Word: "I thirst"? What does this tell us about Jesus? What does this tell us about his experience on the cross? What are the reasons that Jesus would have been thirsty? Physiologically what would have been going on in a person suffering as Jesus did? What Scriptures are fulfilled by John 19:28-30 or may refer to this aspect of the crucifixion? Why was fulfilling Scripture important to Jesus? Why do you think the New Testament makes such a strong point about Jesus' physical suffering? What difference would it make if Jesus were a divine person who didn't actually suffer on the cross? What difference would it make if Jesus were only a human being martyred on the cross? 45. "Gall" (Hebrew rōʾsh, Greek Septuagint cholē) probably refers to a Babylonian plant name which originally meant "head" of some kind of plant. It comes to mean "poison" and "poisonous" and occurs twelve times in the OT. In Psalm 69:21 it is used figuratively as "bitter herbs" (TWOT #2098). 46. Vinegar (Hebrew ḥōmeṣ) comes from ḥāmēṣ, "be sour, be leavened" (TWOT #679b). 47. "Again, what of Rabbi Hiyya ben Ashi's dictum in Rabbi Hisda's name: When one is led out to execution, he is given a goblet of wine containing a grain of frankincense, in order to benumb his senses, for it is written, Give strong drink unto him that is ready to perish, and wine unto the bitter in soul. And it has also been taught; The noble women in Jerusalem used to donate and bring it. If these did not donate it, who provided it? As for that, it is certainly logical that it should be provided out of the public [funds]: Since it is written. 'Give', [the implication is] of what is theirs" (Babylonian Talmud, Sanhedrin 43a). Mark mentions "wine mingled with myrrh" (Mark 15:23). First century army physician Dioscorides Pedanius observed the narcotic properties of myrrh (Materia Medica 1.64.3). 48. Thomas F. Johnson, "Sponge," ISBE 4:605. Sponges were also carried by Roman soldiers to use the way we use toilet paper. 50. Kalamos, "1. reed, 2. stalk, staff" (BDAG 502; Matthew 27:48; Mark 15:36). This sometimes causes confusion, our dramatic depictions of the cross usually picture Jesus elevated far above the onlookers. However, most likely his cross was much shorter. All that was necessary was to have the feet elevated high enough so they didn't touch the ground. We have some reports of the feet of crucified criminals being ravaged by dogs. A common guess is that Jesus' cross stood some 7 feet high (Brown, Death, pp. 948-949). 51. "Received" (lambanō) carries the idea "to take into one's possession, take, acquire" (BDAG 583, 3).